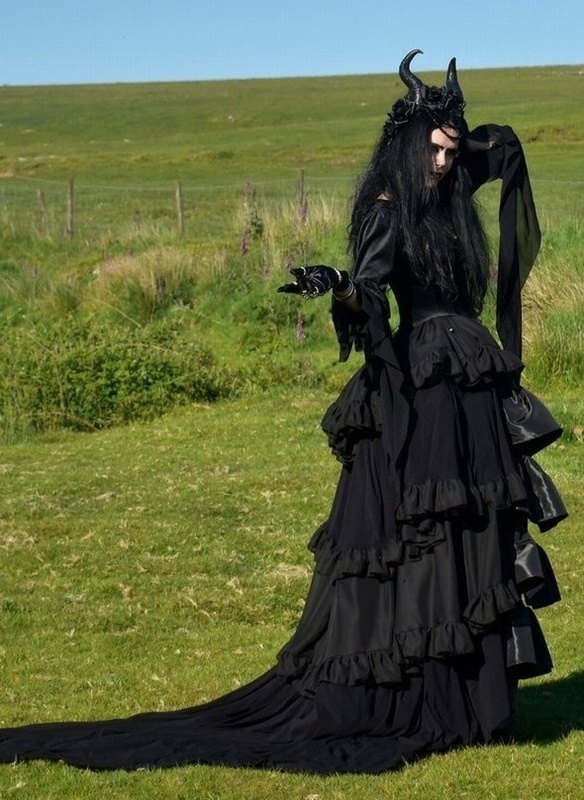 The amazing Funerialle Gown - unique and exclusive to Moonmaiden Gothic Clothing! The bodice has a brocade panel at the front, edged with gathered lace, all up the front, back and neckline The upper sleeves are slightly puffed, with a gathered coutil panel at the elbow. The outer cuffs are gathered mesh, with a steamed velvet cuff underneath, edged in lace. The skirt is so awesome it really is the most gothy intricate thing we have ever made! Taffeta tiers at the front , and layers and layers of mesh and net tiers all around the back, meeting at the front. It comes with a taffeta underskirt to give it extra shape, and has a long train at the back.